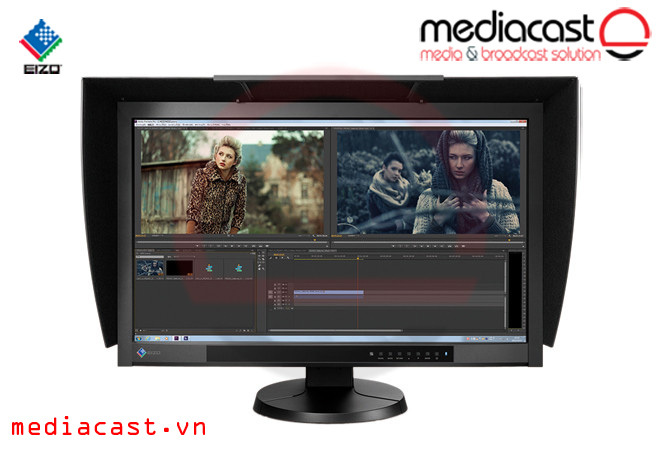 Eizo CX270-BK-CNX 27" Widescreen ColorEdge IPS Monitor là màn hình 27"'' sử dụng tấm panel IPS, được tích hợp hệ thống cân chỉnh màu tự động cho độ chính xác rất cao. Được sử dụng nhiều cho đồ họa, sản xuất video hậu kỳ, hiệu chỉnh màu, in ấn, chế bản và photo. 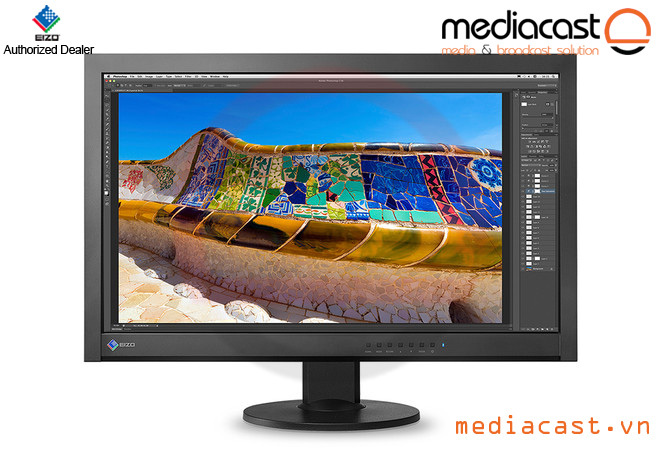 The CX270-BK-CNX 27" Widescreen ColorEdge IPS Monitor from EIZO comes equipped with the EX1 Calibration Color Calibration Sensor and ColorNavigator Software for enhanced color accuracy. 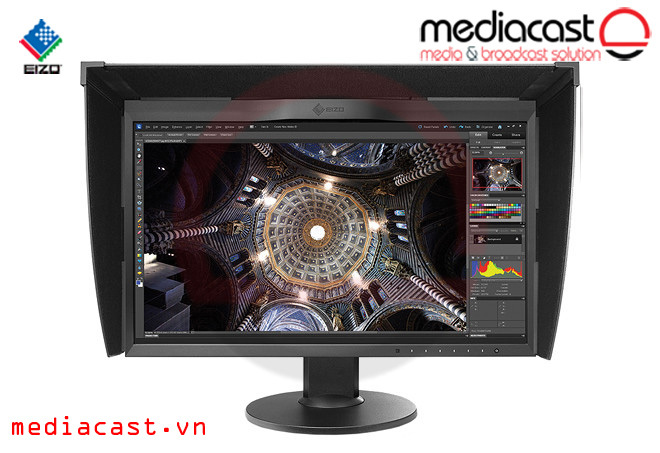 This EIZO monitor utilizes In Plane Switching (IPS) technology to provide an enhanced picture with a 2560 x 1440 resolution along with a 6 ms response time. 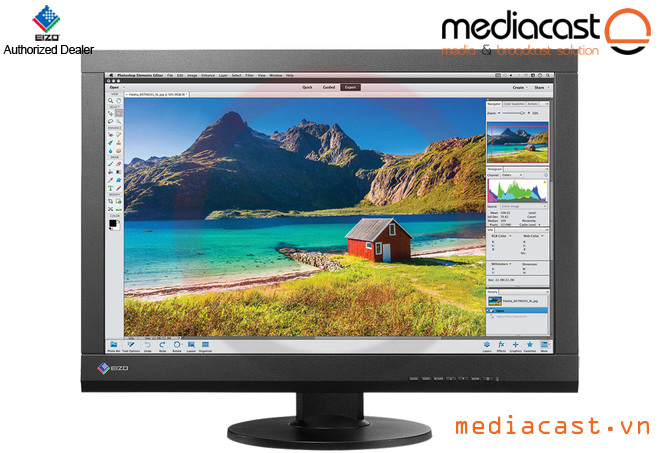 View this monitor from a wide variety of angles as it supports 178° vertical and horizontal viewing angles. Connect this monitor to a variety of input devices with DVI-D, HDMI, and DisplayPort connectivity along with two USB 2.0 ports to make connecting peripheral devices quick and easy. Select a gamut and input target value for brightness, color temperature, and gamma. When calibration is finished, the results are displayed on the screen. You can name your profile in the "Adjustment Name" box. If necessary, you can fine-tune the brightness and color manually by selecting "Finely Adjust." You can also set EasyPIX to rmeind you to recalibrate yoru monitor after a specified number of hours have elapsed and then recalibrate your monitor to the same settings by selecting "Readjust." 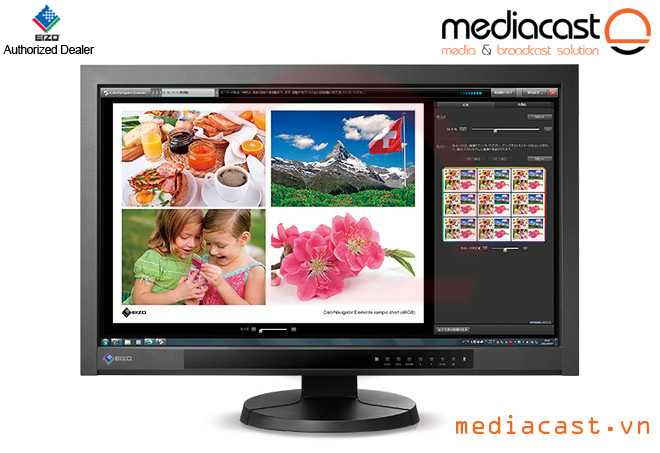 EIZO's ColorNavigator calibration software makes calibration simple and produces predictable color results. ColorNavigator works with a wide range of measurement devices and provides hardware calibration by directly utilizing the monitor's look-up table. The monitor's built-in correction sensor automatically maintains the calibration settings by self correcting at specific intervals set by the user. 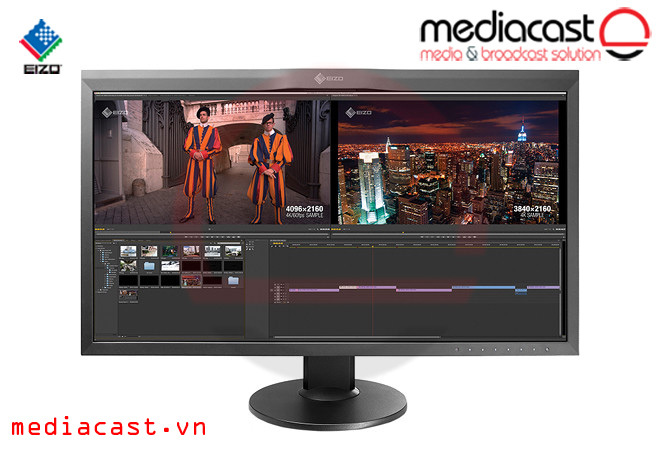 This CX series monitor comes equipped with a built-in correction sensor housed within the front upper bezel. This sensor records your adjustment results, and maintains the white point and brightness values by automatically readjusting the settings at specific intervals that you determine. Even if the monitor is switched off or not connected to a computer, it will stick to its preset schedule and self correct. The built-in correction sensor works with both ColorNavigator and ColorNavigator Elements to automatically maintain your settings. 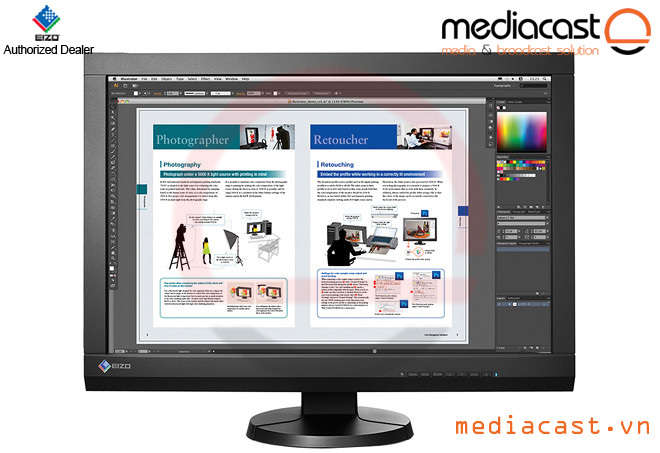 EIZO has shortened the time it takes for the monitor's brightness, chromaticity, and tone characteristics to stabilize with a shortened warm-up time of 7 minutes. For confirming your work in a photo studio or taking your monitor with you on location, you can easily work remotely. EIZO's patented Digital Uniformity Equalizer (DUE) technology compensates for fluctuations in brightness and chromaticity to produce a more uniform image across the screen. DUE technology also counterbalances the influences that a fluctuating ambient temperature may have on color temperature and brightness to ensure stable image display. The gamma level for each ColorEdge monitor is adjusted at the factory. This is accomplished by measuring the R, G, and B gamma values from 0 to 255, then using the monitor's 16-bit Look-Up Table (LUT) to select the 256 most appropriate tones to achieve the desired value. A wide color gamut reproduces 97% of the Adobe RGB color space so images shot in RAW can be converted to Adobe RGB or images shot in Adobe RGB will be displayed correctly. 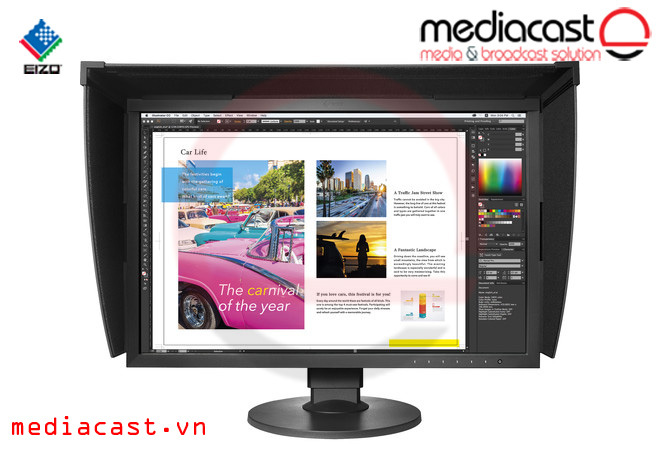 The wide color gamut also ensures that the monitor reproduces almost the entire ISO-coated and US web-coated CMYK color spaces used in printing. Using the DisplayPort input, the monitor offers 10-bit simultaneous color display from a 16-bit look-up table which means it can show more than one billion colors simultaneously. This is 64 times as many colors as you get with an 8-bit display which results in even smoother color gradations and reduced Delta-E between two adjacent colors. With a high contrast ratio you can view this screen from a variety of angles, and even in a dimly lit room as the dark tones retain their depth creating a more dynamic picture. DisplayPort, HDMI, and DVI-I inputs are included for connecting to various types of graphics boards. The HDMI input also offers direct connection with digital cameras. Two USB upstream ports allow two computers to be connected at once so it's not necessary to reconnect the USB cable when using the ColorNavigator software and switching between the two computers. For video editing or post production work, an overdrive circuit is included to reduce gray-to-gray response time to 7.7 ms and ensure that moving images look clean and sharp with minimum ghosting. 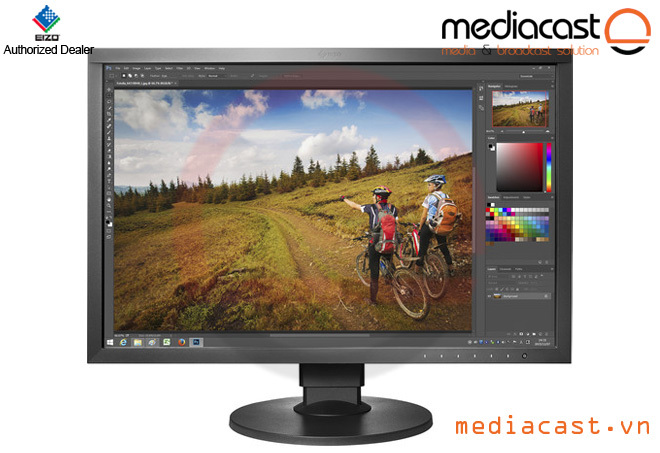 7 preset modes are included: Paper, Adobe RGB, sRGB, Calibration, and three user-adjustable modes. With the bundled ScreenManager for Pro (compatible with Windows OS only), you can assign a mode to an application so that mode will automatically become active when you call up an application. Box Dimensions (LxWxH) 28.5 x 22.0 x 14.0"